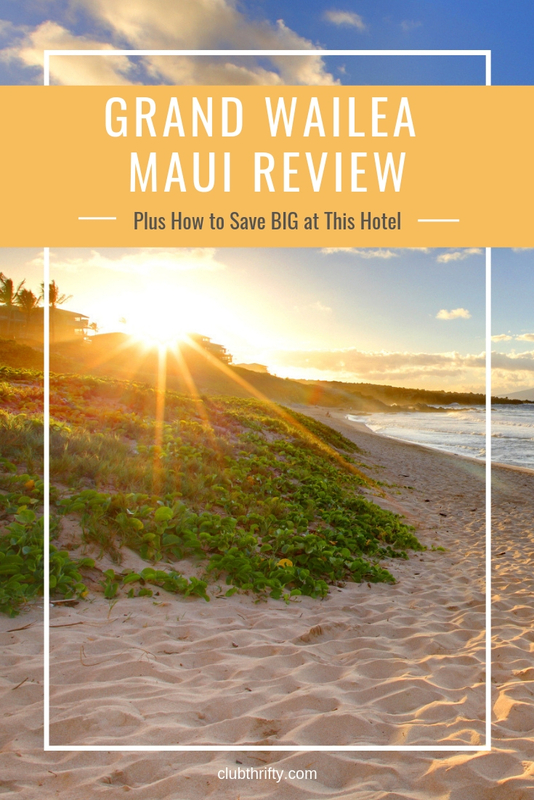 The post Grand Wailea Maui Review, Plus How to Save BIG at This Hotel appeared first on Club Thrifty. In February of 2019, my husband and I took off for a romantic, kid-free trip to Hawaii. We started our journey on the island of Maui and ended on the idyllic paradise island of Kauai. While each island has its own attributes and special features, I do think there’s something special about Maui. Not only is the island absolutely gorgeous, but there’s so much to see and do. And…..the whales! We visited the Grand Wailea in the thick of humpback whale season, so I was practically in whale heaven the entire time. 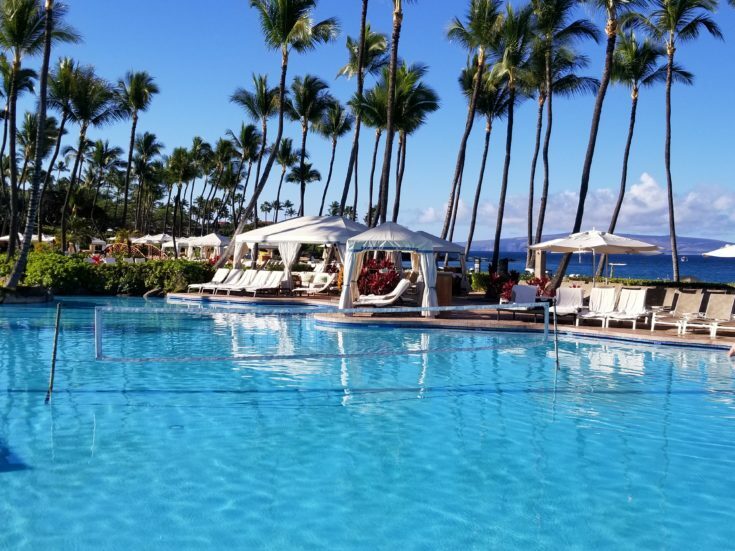 This review will go over our four-night stay at the Grand Wailea in Maui, including amenities, costs, and our main thoughts on whether we think the hotel is a good value. We’ll also go over some of the ways you can save big on this luxury hotel — or even stay for free! First off, it’s important to remember that Hawaii is not a budget travel destination by any means. While Southwest recently starting flying to a few of the islands, Hawaii is still crazy-expensive to visit. It’s pricey to fly there and even pricier to stay in a condo or a resort. It can still be affordable though if you make some savvy decisions along the way, which is what this review is about! In terms of paid rates, you can normally book a basic Terrace View room for around $500 per night during the off-season. During winter, rates normally start at around $800 per night and up! Also remember that, in addition to the nightly room rate, you’ll also pay a $30 per night resort free that covers the cost of wifi and entry into the property’s dramatic pools and grottos. Where I am generally against resort fees, the Grand Wailea is one property where you do get a lot of bang for your buck for this added fee. You’ll also be charged $35 for valet parking every day you park at the property, and there is no option to do free paid parking on your own. With these two fees in mind, you have to plan an additional $75 in fees every day. 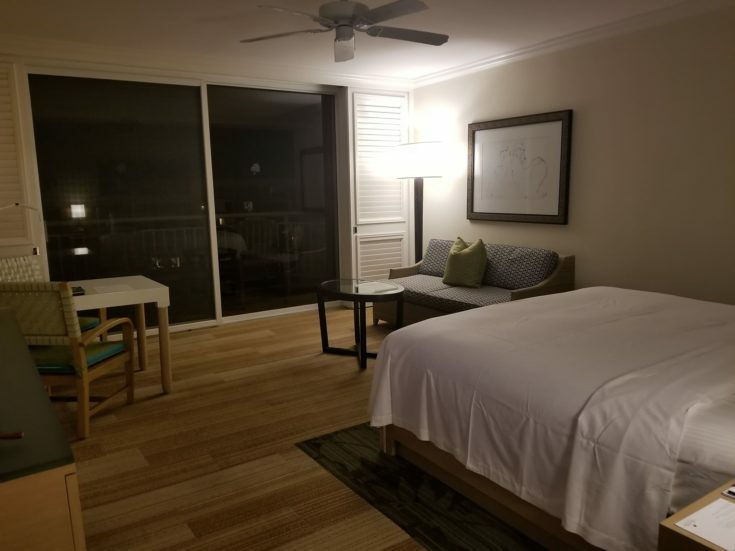 Hilton Silver members and up get their 5th night free when they book with rewards points, so you could feasibly book five nights at this property for 380,000 Hilton Honors points. Hilton waives resort fees on award stays, so you could save another $30 per day this way. Now that I’ve stayed at this property, I can honestly say I think it’s an excellent value for 95,000 Hilton Honors points. Not only is it beautiful, but the rooms are huge and the property is gorgeous! We’ll break down all those details in a minute. As Hilton Diamond members, my husband and I ended up on the 9th floor of the Napua Tower. That set us pretty far back from the water since this building is in the middle of this ginormous property, but it also gave us some pretty spectacular view of the water and beach below. The great thing about the Grand Wailea is the fact that the rooms are so gigantic. The Hilton website lists the basic room, which is what we had with an ocean view, at 640 sq. ft. – not counting the terrace. I absolutely believe it! Our room was really big with plenty of room to sleep, keep our suitcases, and lounge about. We had a small sitting area and a section with a desk and two chairs. The bathroom was also giant, and I truly appreciated that. 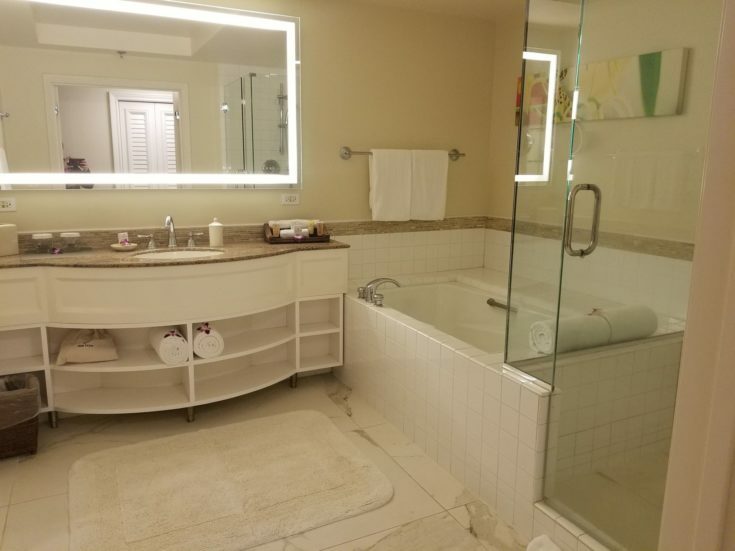 It featured a separate shower and a giant soaking tub I used every day. You could tell our room was older but it was very well taken care of and clean. We also had a small kitchen area with free coffee each day and a mini fridge! 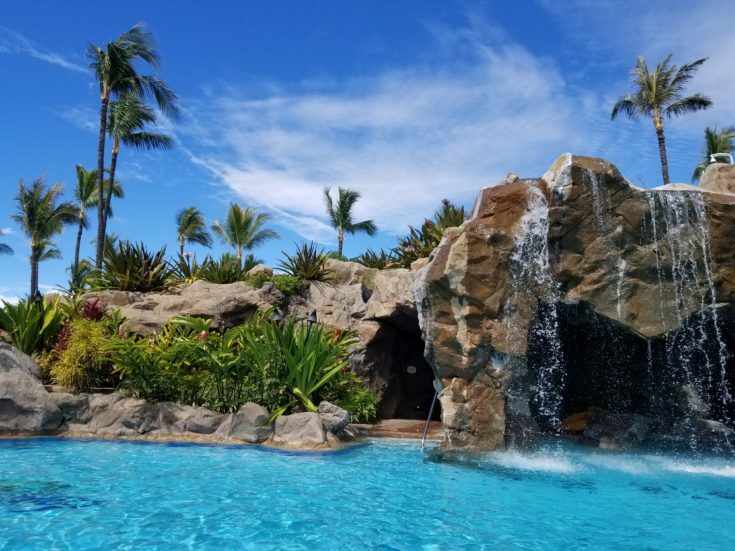 I have stayed at many beautiful luxury hotels in my time, but the Grand Wailea in Maui has some of the most beautiful grounds I have ever seen. 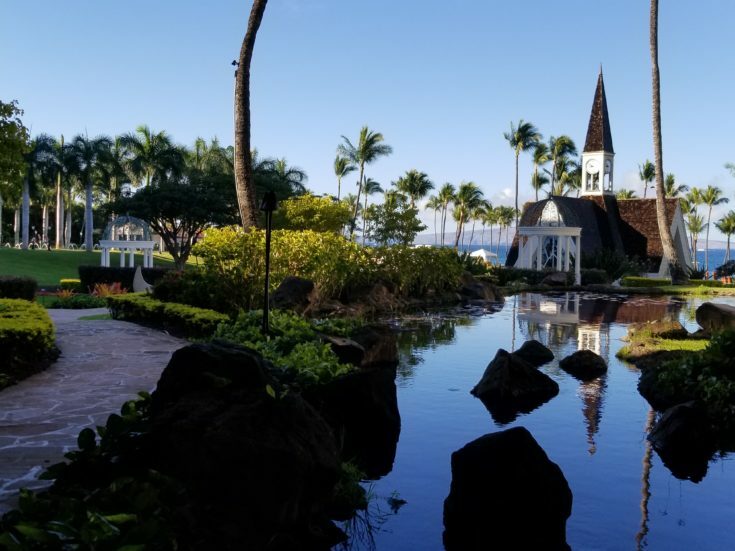 Every square foot of the hotel’s exterior is expertly manicured and landscaped featuring fountain streams, waterfalls, koi ponds, and stunning flowers and greenery. The view from our room was also spectacular. The water was calm and relaxing, but we also easily saw 20-30 whales from our balcony every single day! In fact, we saw more whales from our balcony at the Grand Wailea than we saw during a whale watching tour we book out of Makena Beach nearby. In terms of the pools and hot tubs, the Grand Wailea has some of the best amenities I have ever seen. The property features a giant adults-only pool with its own hot tubs and separate bar area. There is also a sprawling pool for kids with several waterslides, a giant rope swing, a lazy river, and a zero-entry beach area. 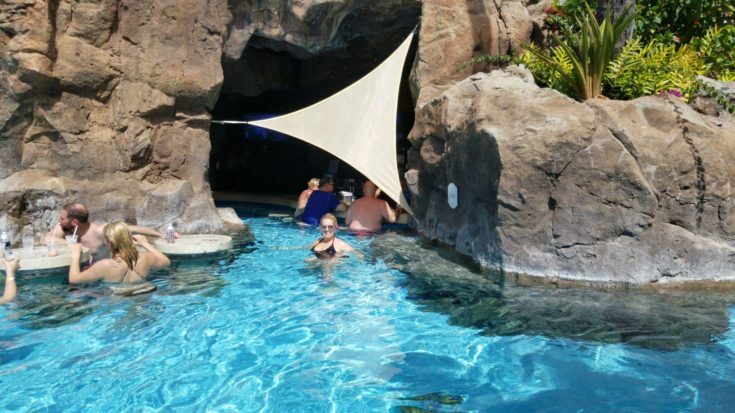 In another adult area, there is a grotto-style swimup bar. The drinks are pricey at $15 each and up, but had one there anyway. You can even order pub-style food at the swimup bar, but we didn’t because I thought eating in the pool would be gross! Here I am in the swimup bar area……I had a mojito! While the Grand Wailea has many restaurants on their property, we only ate at a few of them. We had dinner at the Moloniki restaurant near the pools one night, and we also had breakfast in the grand dining room every morning. Our dinner at the Molokini was tasty but on the pricey side. We had four beers (two each) and split three appetizers for a grand total of $90. The Ahi Poke nachos, calamari, and ahi tuna were amazing though. Breakfast was also really good, although it was not cheap. They had a $38 breakfast buffet that we never took advantage of. Most of the menu items on the ala carte menu were around $25, although a few started at $20. Each menu item also came with coffee and juice. Fortunately for us, we have Hilton Diamond status! This meant we got a $30 breakfast credit each day. While we did have to get creative to stretch this benefit, the large portion sizes made it easy for us to split breakfast every morning. 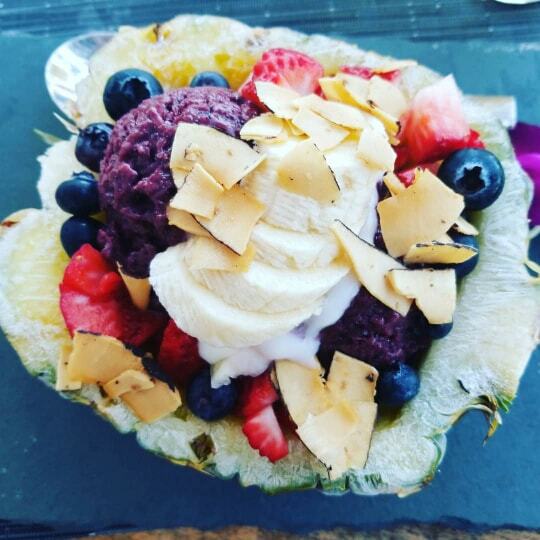 We split an omelet one day, an acai bowl on another day, and some avocado toast on another occasion. All our breakfast items were delicious, and the $30 breakfast credit made them inexpensive or free in some cases as well. Most people who are visiting Hawaii don’t expect to score an insanely frugal trip. At best, it’s more reasonable to expect to pay a little more than usual for lodging, food, and flights. Hawaii is one of the most popular destinations in the world, after all. In my opinion, Hawaii is also one of the most beautiful destinations in the world. I would even go as far as saying that some parts of Maui, Oahu, and Kauai are as beautiful as Bora Bora! You can also save money in Bora Bora, but Hawaii is much closer to home. Get the Hilton Aspire Credit Card from American Express for Hilton Diamond status. While you can earn Hilton Diamond status with paid stays at Hilton hotels, you can also get it automatically with the Hilton Aspire credit card. The Hilton Aspire from American Express also offers a big signup bonus, a $250 annual airline credit, a $250 annual resort credit, and a free weekend night every year. It’s pretty sweet and one of my favorite rewards credit cards out there. Eat a late breakfast and pretend it’s lunch. 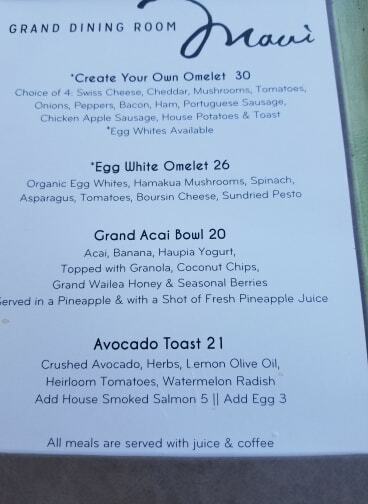 With Hilton Diamond status from the Hilton Aspire credit card, you get the $30 breakfast credit I talked about. 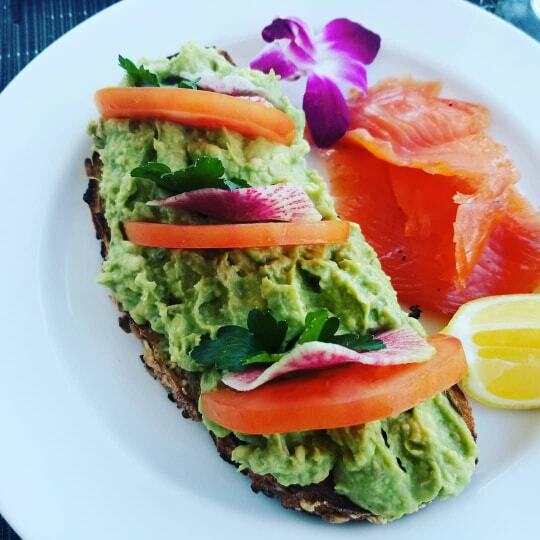 Since breakfast at the Grand Wailea lasts until 10:30 a.m., you could eat at 10:00 a.m. or later and count it as an early lunch. We did that on a few different days and it worked great since we also had some basic snacks in our room. Score an annual $250 resort credit. Remember how the Hilton Aspire from American Express offers a $250 annual resort credit? That credit is only good at Hilton properties deemed as resorts, which includes the Grand Wailea. I charged all our food to our Hilton Aspire credit card during our trip and the $250 resort credit was added to my account by the time I got home. 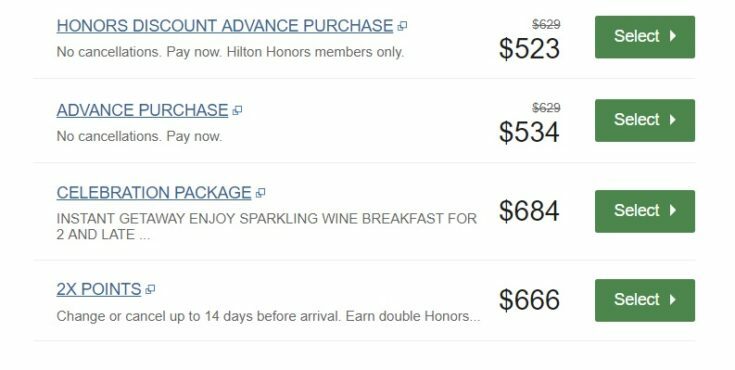 Pay with Hilton Honors points. If you have Hilton Honors points already, snagging this hotel for 95,000 points per night isn’t a bad deal at all. Also remember that you get your 5th night free when you book with points provided you’re a Hilton Silver member or higher. Head to the grocery store. With a refrigerator in your room, there’s no reason you shouldn’t pick up some basic snacks and food and keep it in your room. Greg and I went to the Island Gourmet Market down the street to stock up on snacks for lunch and beer. This store isn’t cheap by any means, but you can pay $2 per beer instead of $8 per beer like you would at the hotel bar. It was also nice to have vegetables and hummus, chips, and other light snacks in our room so we could avoid a pricey lunch. 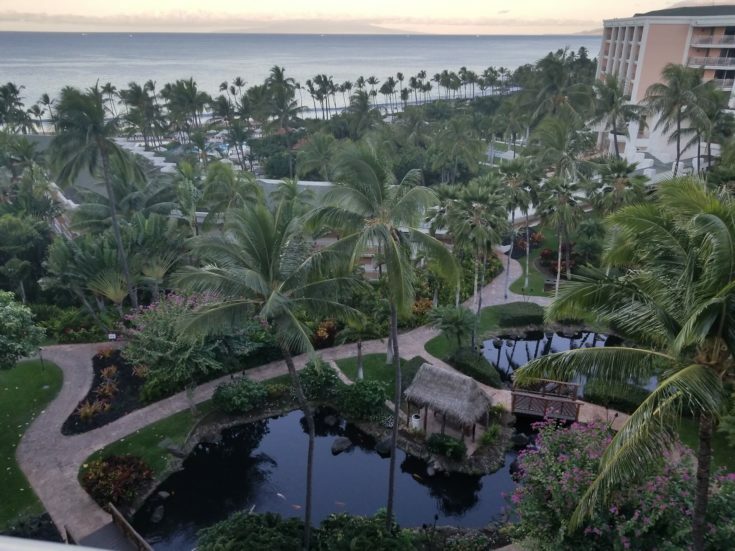 Maui is a dream destination for sure, and the Grand Wailea is easily one of the best hotels on the island. The property is huge and absolutely gorgeous, and you will not regret booking your stay here! 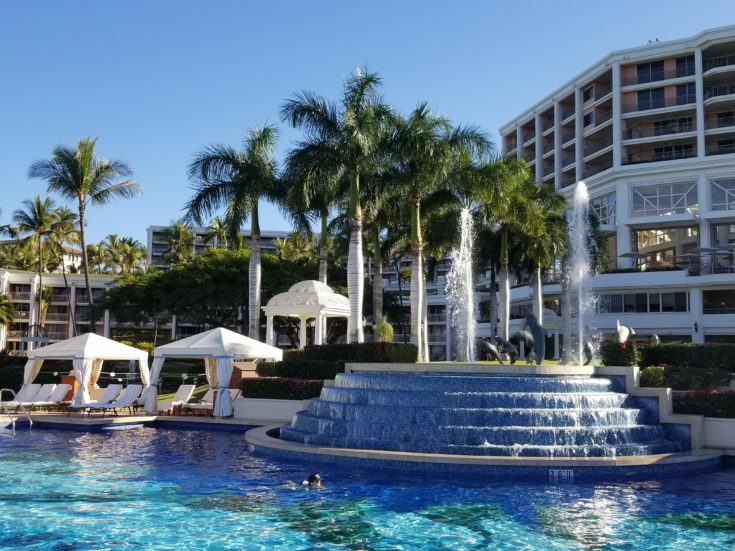 As someone who is currently sitting on over 700,000 Hilton Honors points, I am tempted to go back and take my kids for some fun in the amazing pools. 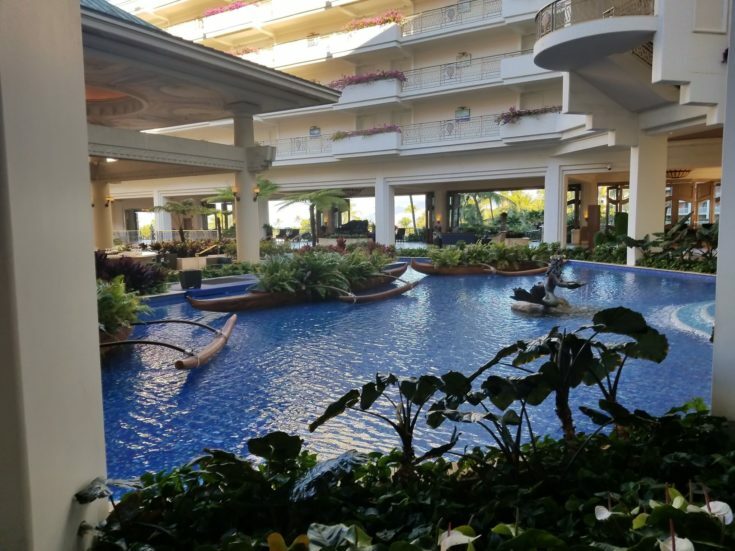 Have you been to the Grand Wailea Maui? What did you love about it? Previous Previous post: My Ice Cream Taste Test: Are Haagen-Dazs and Ben & Jerry’s Overrated?